In the "Language" column, you can see the main language of the corresponding information source. Most sources offer just one main language. 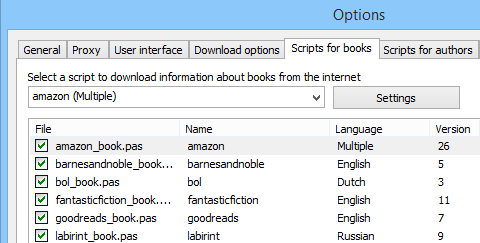 With Amazon, different languages are supported, that's why we see "Multiple" in the "Language" column. But how do we select our preferred language for the Amazon site? For example, we may want to download information in Italian, and not in English. Select the "amazon (Multiple)" entry from the dropdown list at the top, or just click the corresponding item in the main list. 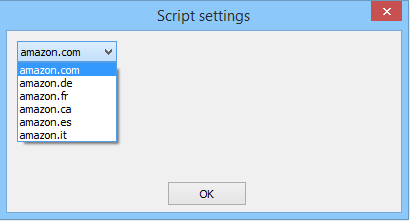 After this, click the "Settings" button. Select your preferred local service (for example, "amazon.it" for Italian or "amazon.de" for German) and click "OK". Support for further sites can be added. Just send us a link to a good site about books, and we will consider adding support for the site.